Henties Bay does not have an impressive history of being discovered many centuries ago by some well-known seafarer sent on important explorations by his king to far-off countries, neither does it have the benefit of an age-old cross confirming its historical importance or a rich history of diamonds scattered on its beaches. 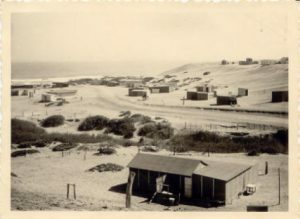 Although without pretence and true to the informal character of Henties Bay its “discovery” was remarkably similar in events than those of some of our historical neighbours – events that include hopeful diamond explorers and big-game hunters who challenged the Namib Desert and the Skeleton Coast in desperate attempts to find fortunes or merely to survive. “Explorers” whose lives were saved by the existence of a small freshwater fountain situated in an old tributary of the Omaruru River, literally on the beach. 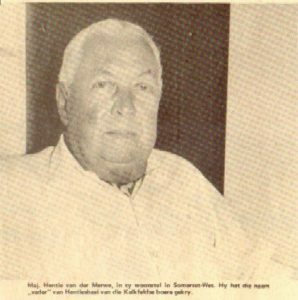 Major Hentie van der Merwe, Kalkfeld farmer, motor-dealer and big-game hunter, also known as the “father” of Henties Bay told his story to Die Brandwag, 29 April 1977. In 1929 he heard of a museum in Pennsylvania offering a small fortune for a rhino skeleton and immediately set out with a half-ton Ford truck and a few helpers towards the Brandberg to hunt for rhino. After he shot an animal he realized that their water reserves were low and there was no time to prepare the carcass in the usual way (that is to place the bones in an ant-heap for the ants to eat it clean). He packed up the half-cleaned carcass and set out on a journey towards the sea in the hope to find water. After they reached the sea ten miles north of Cape Cross they set out on a difficult journey along the beach towards the Omaruru River in a desperate attempt to find fresh water. The journey was difficult – through thick sand with the stinking, rotting carcass intensifying their craving for water. Without finding water in the dry riverbed they struggled on even further south. A few miles south of the Omaruru River mouth they came to a deep sand valley where they found a patch of green reeds fed by a small freshwater spring – an oasis in this barren land! Whatever the case might be, Major van der Merwe immediately fell in love with the place and returned there on his next December holiday. He built himself a wooden shack from crates used for the importation of motorcars in those early years. For years it was his own private haven whereto he escaped every December. Later, he started inviting his friends along who referred to it as Hentie’s bay, which eventually became Henties Bay as more people claimed their own little place amongst the dunes. They mainly camped in tents and brought everything along, even livestock such as chickens, sheep and goats, which was then slaughtered when needed. Fresh Water FountainA few miles south of the Omaruru River mouth they came to a deep sand valley where they found a patch of green reeds fed by a small freshwater spring – an oasis in this barren land! Henties Bay has a peaceful, rustic atmosphere and the absence of heavy traffic, the mild climate and long stretches of unspoilt beach creates the ideal setting for a leisurely holiday with long walks, sunbathing and picnicking or a few days rest for the overseas visitor after a tiresome journey on hot and dusty roads. Parts of the beach are closed to anglers, vehicles and quad bikes to offer pedestrians and sunbathers maximum peace and quite. The main swimming beach is down at the valley where the super tube is – quite a busy spot during the December holiday season. Solitude Bay is south of Henties Bay and ideal for long walks, beach picnics or fishing. Keep in mind that the water is icy cold, ranging from 13 to 18°C, and the current very strong with whirlpools in places which makes it dangerous to swim. It is not advisable to swim too deep unless you are a strong swimmer. In 1951 the South West Africa Administration proclaimed erven in the riverbed that could be rented with the condition that no permanent structures were erected. Shacks were built from wood and hardboard. In those years there was only one shopkeeper, a German named Köstens, who sold the bare necessities such as rice, sugar, flower, tinned foods, coffee and paraffin. In 1966 the Administration decided that the people must move out of the riverbed and 27 people were given the opportunity to buy erven on the north and south dunes, either side of the riverbed. In 1967 the De Duine Hotel was built and since then the town has slowly started to develop. It was always believed that the South-West-African coastline should be rich in diamonds. Although it is true of the southern part from Oranjemund to Lüderitz, called the Spergebiet, diamonds only occur sporadically in limited quantities along the Skeleton Coast at Toscanini, Terrace Bay and at Möwe Bay. The first account of diamonds along the coast was in 1910 when a land surveyor of the German Schutztruppe allegedly found a 2.5 carat diamond at Cape Cross (Kolonie und Heimat, 1910). A 3.75 carat yellow diamond was also found south of the Omaruru River Mouth in 1910 (Reuning, 1931). During extensive investigations between 1943 and 1947 no more diamonds were found south of the Ugab River. But opportunists were always lured by the remote possibility of discovering diamonds. In the early 1960’s Ben du Preez and Jack Scott prospected for diamonds at Terrace Bay, Toscanini and just south of Henties Bay. The mining holes are still visible just south of the town’s residential area, Extension 6. Gravel was dug out and transported to Henties Bay where it was washed and gravitated. Cement blocks, remnants of the processing plant, are still visible on erf 1489, Oranje street where the gravel was washed. Five diamonds were allegedly recovered from the mine, but rumour has it that these diamonds were planted and the mine finally closed in 1971. In the early 1960’s the South African Light House Department erected navigational light towers along the then South West African coastline at Möwe Bay, Terrace Bay, Toscanini Mine, Cape Cross and south of Henties Bay at a spot called Cape Farilhao. The purpose of these light towers was to aid the local and foreign vessels that were sailing close to the treacherous Namibian coastline. The radar of the ships only detects objects deeper inland that stand out instead of the coastline itself because the coastline is so flat. These light towers consisted of a 15 – 20 meter mast with four identification beacons. A day marker with specific identification markings (mostly a specific colour combination or a wooden cross in the case of Cape Cross) helped vessels to identify the station during daylight. A 12V DC revolving light on top had a range of 13 nautical miles. This flashing light was coded to indicate the specific station at night. A Racon (radar responder) was situated on top of the mast and was triggered by the ship’s radar to identify the specific station. There was also a radio beacon that sent out a specific code to vessels that identified the station. The Racon and radio beacon had a range of 25 nautical miles. These light towers fell into disuse due to modern navigation laws and techniques and were demolished with time. For a long time the tower near Henties Bay served as a perch for cormorants, but was, sadly, also removed in the early 1990’s and with that a part of history and nostalgia of the earlier years. When driving south along the dune road to Jakkalsputz the remnants of this light tower can still be seen at Sandhoek (Cape Farilhao, known today as Solitude).